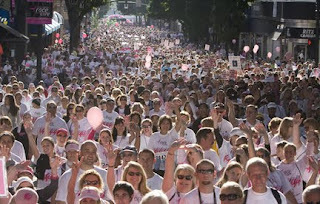 What a fantastic turn-out for the 2009 Koman Race for the Cure! 43,000 participants filled the streets of downtown Portland yesterday and it was incredible. I walked with my mother, my sister and my daughter. I walked in memory of, and in support of, many women. Let's take care of each other ladies! We are very important people.